A fine art print of "Patiently Perched" will bring a serene moment to your dining room or office. A hungry heron surveys Ringneck Marsh for an early breakfast, casting a slender silhouette against the morning fog rolling over the swamp. Join this beautiful bird for a well deserved meal! This fine art photograph of "Patiently Perched" is in my twilight wall art series. It brings a calming tone to your day wherever you hang it! Best displayed on metal, the bold colors and vivid details captivate the imagination. Each metal print is ready to hang without a frame, providing a bold, modern look. For a softer, more pastel appearance, choose a canvas print. Two museum-quality fine art papers are also available, should you prefer a more traditional look. A heron surveys Ringneck Marsh for an early breakfast. 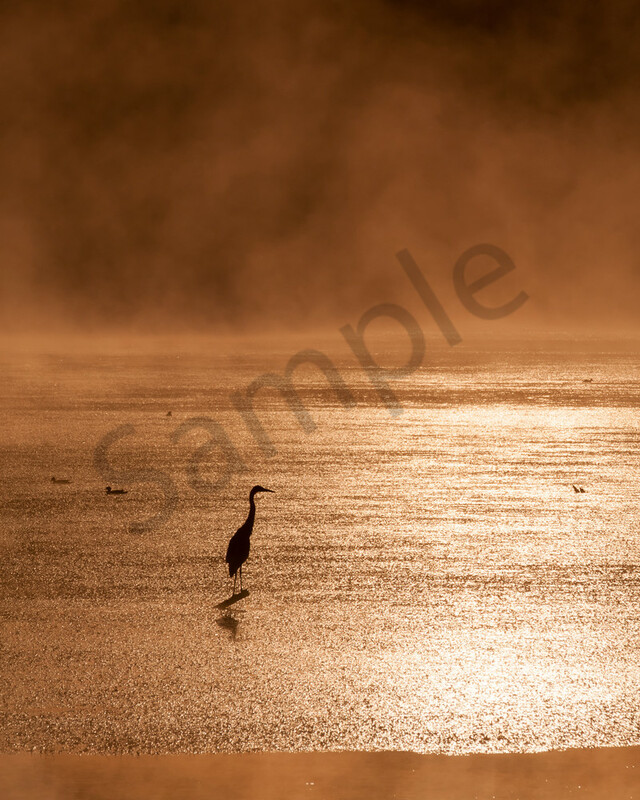 The graceful bird casts a slender silhouette against the morning fog rolling over the swamp.